Done! #24.2 Visit the following places that I’ve never been: Tudor Place. Note: I stole this pic from the internet. The front of the house is currently under construction and the picture I took doesn’t capture how it usually looks. After I read “Martha Washington: An American Life” last year, I started doing research on Martha and George Washington’s family trees. I learned that her granddaughter, Martha Parke Custis (who eventually took on her husband’s last name Peter), lived her adult life in a house in D.C. called Tudor Place. She bought the land with the money she inherited from her step-grandfather, George Washington. And the best part? This house is still around and currently operates as a museum. Tudor Place was the last place Robert E. Lee, the former commanding general of the Confederate army, visited before he died. Martha Parke Custis’ niece was married to him. Eleanor Calvert, from the prominent Maryland Calvert family (Calvert County ring a bell to D.C.-MD-VA people? ), was the mother of Martha Parke Custis. That’s some serious lineage. She died in Tudor Place. Tudor Place boasts the most George/Martha relics outside of Mount Vernon. So, today, on this glorious Presidents’ Day, I took a trip to the mansion with my friend, Erin. Aside from not being able to take pictures in the house, it was pretty cool. Original chair cushions that Martha Washington made. These were awesome and in such great condition. An original letter from George Washington to Martha explaining how he wouldn’t be back home for seven years after taking up the position of Commander-and-Cheif of the Continental Army. Ouch. A lock of George’s hair, which his step-granddaughter wore in a necklace during her wedding. Kind of weird. 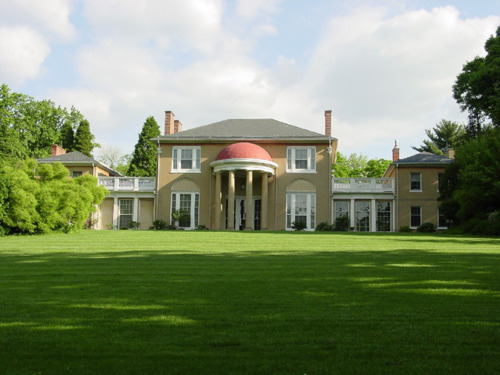 The mansion used to boast a view of the Potomac, but thanks to new building development during the last century, one can no longer see the river. One of the tour guides (or docents if you’re feeling fancy) was named Elizabeth Taylor. Erin and I giggled when we saw her name tag. We’re easily entertained. If you’re in the D.C. area, I suggest taking a trip to Tudor Place. Apparently the gardens are very beautiful, so it looks like I’ll have to make another trip in the spring/summer. Click here for more info on the mansion.